“Ow! Help!” my mother yelled over the rush of roaring waves. Another wave crashed into her and I saw the rock shelf she was pinned against as the water receded. We dragged her to shore where we saw her bloody, skinned knees. They were bad. She used the small dropper to dab some ointment on her still-bleeding knees. 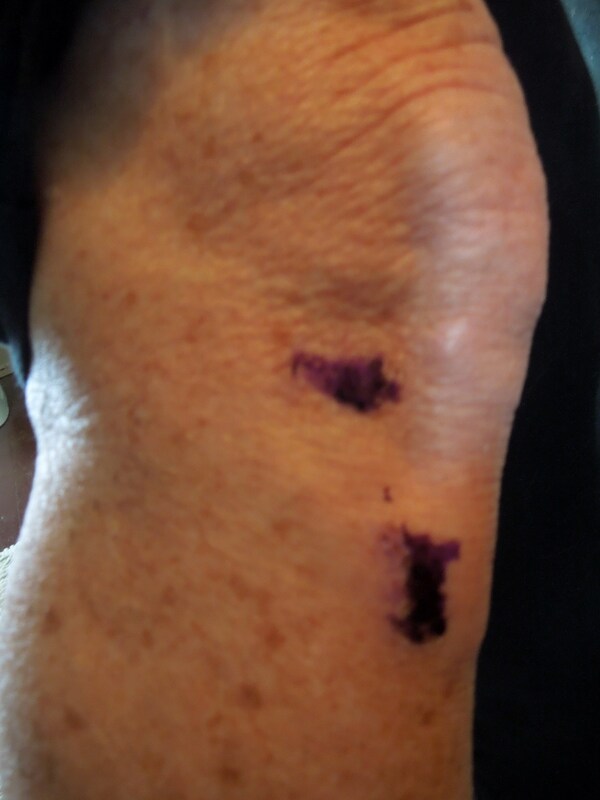 The ointment was bright purple, like ink. “Does it hurt?” we asked. She shook her head, then capped the vial. Only then did she notice she’d gotten it on her hands, too, so went to the bathroom to wash it off. To her surprise, the stain was ink-like. The purple seemed permanent. “What is this stuff?” we wondered aloud. We examined the bottle a little more closely. Sure enough, there across the front was the name of the product: VIOLET. We laughed. Guess we should have read this first. Her knees looked like they might be purple forever. But they were also scabbing quickly and didn’t hurt anymore, so whatever this stuff was seemed to be effective. She tried scrubbing the color off a few times, causing new abrasions to her already-injured knees, but doing little to fade her violet legs. We started to think of it as her Puerto Rican tattoo, since the color was not unlike an inked tattoo. News of her purple spots got around to her friends and one, a school nurse, asked her if she remembered all the hullabaloo about Dr. D–— the premier OB/GYN in the Cincinnati area in the 1960’s. Everyone who was anyone saw him during that time. And apparently, many of these pregnant women were suffering from yeast infections. 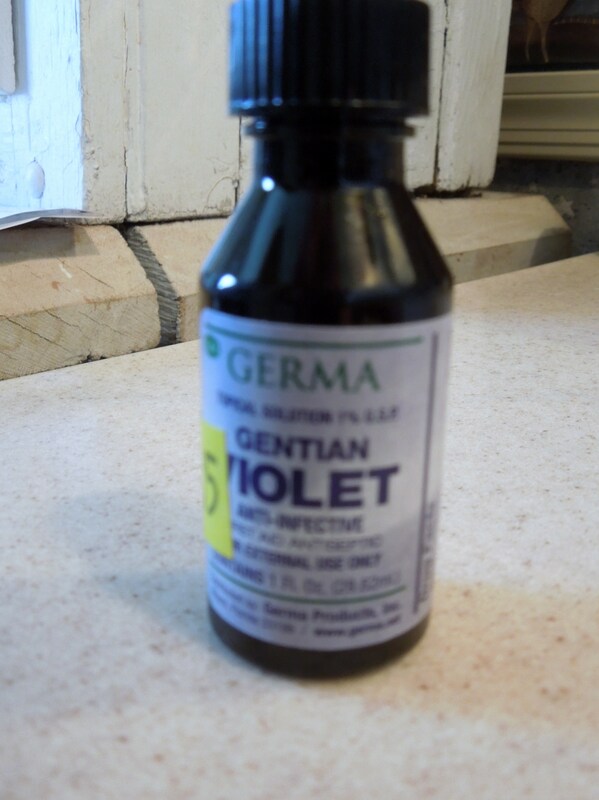 So he prescribed gentian violet: an antifungal, antibacterial dye used as a topical antiseptic. What had we done?! We stared at my mother’s purple-stained knees. Was this stuff even safe? A little internet research revealed that gentian violet, a.k.a. methyl violet, or crystal violet, was, indeed safe, if a little outdated. It’s still on the World Health Organization’s list of acceptable drugs, for whatever that’s worth. More commonly, it’s included as a dye in ink and used to mark skin for surgery or body piercing. It is noted for being one of the best agents for “scabbing” up an abrasion. So what if the color never goes away? Textile dye – Queen’s University engineering students “purpled” their jackets with Violet. Mouth Ulcers – gives new meaning to the phrase, ‘You sure got a pretty mouth.’ But don’t swallow! It can be poisonous. It’s been two weeks and my mother’s violet knees are finally starting to fade. She swears she will never use the stuff again, but I don’t think she realizes how useful it is. I’m already thinking that we’ll break it out next Easter to dye eggs. What would you use Violet for? Glad your mom was okay! Isn’t funny the things we learn on vacation that we never expected to. Yes. It’s part of what makes travel fun. A crazy kind of souvenir, in a way. And stories to tell for years to come. Hmmmmmm……. How can we use that on the farm ? ? ? Funny story, but then she is an accident waiting to happen!!! Just kidding. Now that’s a thought! If I thought it would cure everything, I would dip myself in it ! I know. We’re still laughing at her about it. Thanks! Luckily, my mom can laugh about it. She was pretty banged up, but the Violet really helped and was something funny that we’ll always remember about the trip. When I saw the picture of your mother’s hand, I thought she had a terrible bruise. I’m sorry about her knees; glad they are healing and she was ok.
We have Gentian Violet in our medicine chest! I make a “blue juice” concoction for our dog’s ear infections. It works! The last time I made a batch, I accidentally spilled some of the violet onto our yellow formica counter top. I got a damp rag to clean it off, and everywhere the violet touched, it took the yellow color out of the formica! I have white patches now. That is some amazing stuff. Wow! Good to know that we could use it as a paint remover. And it worked on your dog? How incredible is that?! For some reason, a lot of the old-school “wonder” drugs/ointments/topical treatments seem to be in bright colors. There’s this old Chinese topical treatment that’s kind of similar to the Violet except it’s this bright, bloody, orange-red. Very unattractive when put on but it does seem to work. Glad your mom is okay! Interesting. My mom is fine, thanks. Though now I’m thinking that we could apply orange ointment somewhere on her body, too. She could be a walking piece of medical art! Glad to hear that your mother is recovering! Loved the notes at the bottom of the post – I went to Queen’s and many of the engineering students purpled more than just their coats and walked around with purple-hued skin for many weeks! Ha ha! That’s funny. But I can see how easily it can be done with Violet. Why stop at fabric? Holy smokes, this was a riot! I hope your mother feels better, of course. I never knew anything about violet until now. She’s much better, thanks. It’s funny what you learn through travels. I’m glad your mom is safe and recovered pretty well. Yes, I read about Gentian Violet from books but never got to see it’s usefulness. It’s like neosporin with a twist. A colorful remedy to be sure. I have never heard of this stuff and I’ve been around a bit. Sounds like a miracle paint job. Glad your mother is all right. Three weeks now, and still stained. Glad that your mum is OK! What a story! Is the stain still there? Yes! Three weeks now, and she’s still purple. It’s faded, but still visible. If you ever need long-lasting dye, this is the stuff! Don’t worry, Natalia. It did fade. But it took a while.